Traditional stories tell that Lord Ganesha was created by goddess Parvati, consort of Lord Shiva. Parvati created Ganesha out of sandalwood paste that she used for her bath and breathed life into the figure. She then set him to stand guard at her door while she bathed. Lord Shiva returned and, as Ganesha didn't know him, he didn't allow him to enter. Lord Shiva became enraged, severed the head of the child and entered his house. After realizing that he had beheaded his own son, Lord Shiva fixed the head of an elephant in place of Ganesha's head. In this way, Lord Ganesha came to be depicted as the elephant-headed God. We invoke You, O Ganapati of the ganas (Lord Shiva attendants), Who are Brahmana-spati of the brahmas (prayers), the wisest among the wise, Who abound in treasure beyond all measure, the most brilliant one. Do listen to our prayers, come with Your blessings and assurances of protection into our home, and be seated. 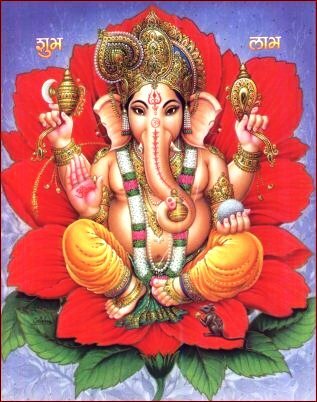 Sit down among the worshippers, O Ganapati, the best sage among the sages. Without You nothing can be done here or far. Accept with honor, O wealthy One, our great and variegated hymns of praise. Now Ganesha is installed in the idol and one can perform arati and light the lamps. 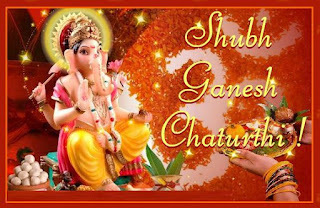 Some people perform the shhodashopachara, which are 16 forms of paying tribute to Ganesha.